A speedometer is basically a device for measuring the speed of a vehicle. 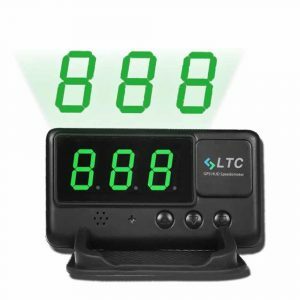 It can be utilized in cars, boats, bikes motorcycles and keeps displaying the speed. GPS speedometers are a new invention and use GPS software to measure a distance from one location to another. They are more accurate than normal speedometers and are mostly used by companies to keep track of their employees when driving fleet vehicles. They also alert drivers who exceed the speed limit thus promoting better safety on the road. In this article, we have done our research and come up with top 10 best GPS speedometers to suit your needs. Appearance: You require to look at the way the GPS speedometer look like for you to decide whether it will appear great in your car or not. There are some GPS speedometers that look sleek and classy. Accuracy: Look for the GPS speedometer that gives accurate results and gives precise readings. It should also have a display that is easy to read ad well illuminated to see results both day and night. Quality: You need to check the customer’s reviews of various GPS speedometers to assist you to know if it lasts for a long time or not. The best GPS speedometer should be durable, dust-proof and waterproof. Price: You require to buy something that fits with your spending plan else, you will have much trouble trying to purchase something that you can never afford. 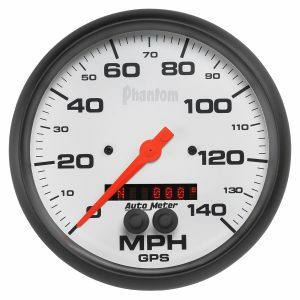 You can use this GPS speedometer for all types of trucks including boats and motorcycles. 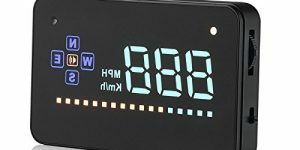 The Auto Meter 5881 Phantom display highly accurate results and include omnidirectional 10 Hz antenna that has 16ft. cable that is needed for operation. This GPS antenna uses three GPS satellites and samples ten times per second. Moreover, this GPS Speedometer is simple to install and require just plug and play. The display features Trip Distance (tripmeter), Cumulative Distance (odometer), time/date, Compass as well as Peak Speed Recall. With its Traditional incandescent lighting will illuminates on the dial perimeter thus it can be used during the night. This is a digital GPS speedometer that has both driving speed system and a compass. 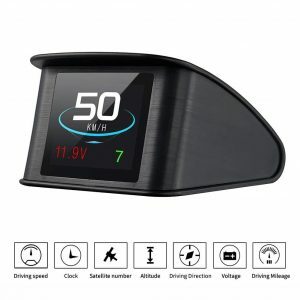 This GPS speedometer usually focuses on important data such as driving direction, speed and over-speed alarm for you to keep your eye in the road. It can work perfectly on any kind of car, trucks or vehicle. Additionally, no professional mounting is needed as it is simple and easy to install. The GPS speedometer has both analog and digital speed thus you don’t need to consider the type of speedometer that your vehicle has. On the other hand, this Universal GPS speedometer is not interfered by other kinds of gauge factors. 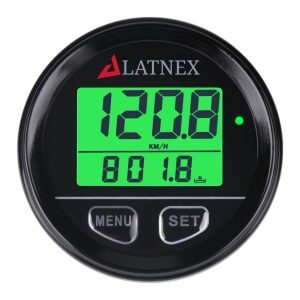 This is a universal GPS speedometer that is quick in displaying data. The KUS Waterproof Speed Speedometer will monitor the speed even on a snowy or a rainy day. It will show actual speed and compass and the signals usually come right from satellite signal receiver. 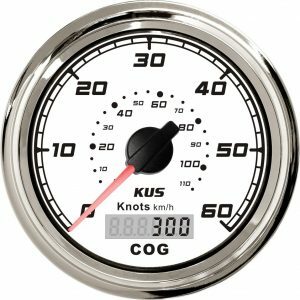 Besides that, setting up this GPS Speedometer is very easy and can be used in all yachts, boats, vessels, etc. The installation dimension of this speedometer is 85mm (3-3/8″) and made to be 100 percent waterproof as well as with anti-fogging protection. Above all, the unit features quick location confirmation and you can choose between yellow and red back-light. Another highly effective GPS speedometer from Intellitronix. It’s suitable for all kind of vehicles including marine boats. 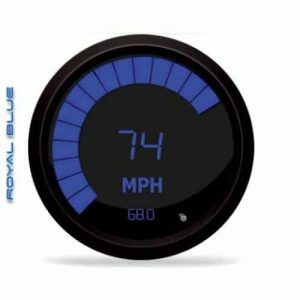 Markedly, this Digital speedometer features super-bright Blue LEDs that have a custom LED bar graph and black bezel. The unit is easy to install and comes with step by step guide on how to install the Speedometer. All the -dash mounting hardware is included in the package. You can easily calibrate the speedometer for diverse tire sizes. With its bright shade of Green let you so see the monitor during the night as well as when there is direct sunlight. The product comes with a lifetime warranty. This is a multi-satellite GPS speedometer that display, compass, speed alarm and will read in different units. It will show odometer and current speed getting signals from the satellite signal receiver. In general, the gauge gives high and has a short startup time. In addition to that, the curved glass is waterproof and has an anti-fogging function. 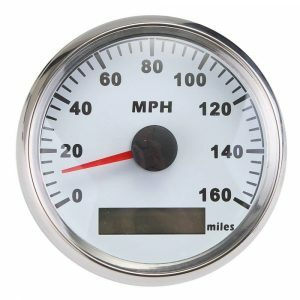 The Speedometer Gauge is usable in all types of boats, cars, trucks and off-road vehicles. For the first time, this gadget will take 30 sec to get signals and after that, it only takes 3 seconds, it gets better when there is a clear view of the sky. The TIMPROVE Universal GPS Speedometer has a high-speed recall memory as well as digital display. You can use it with the press of a button and can show in various units. It works perfectly for all vehicles thus you should not worry about compatible. 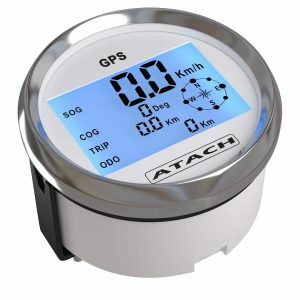 Ideally, this GPS Speedometer shows instance speed using GPS satellite, no wiring thus it does not need to call for any professional installation. The device is likewise compatible with motorcycle and bicycle as you just need to connect it with a power bank. Furthermore, with its Over-speed Alarm, it ensures that you have a safe trip. It will deep three times in case of over speed. This is a complete set of Digital GPS speedometer and it displays real speed with GPA satellite. Installing this speedometer is very simple and just need plug and play. Other than that, it has settable low-speed and High-speed alarms and when you exceed the set value a red light LED flashes to alarm. It also has a settable speedometer with a refresh rate of 0.5 seconds. All the information will be saved automatically including the top speed as it has EEPROM memory. Together with that, made with parts that resist dust and have a waterproof Rate IP65. Get one today and you will get accurate results of your driving. Our nest best GPS speedometer comes from AndyTach. It’s one of the best-selling speedometers you can find in the market. The digital display is well protected with a flat glass that offers less sun glare during the day and will also allow you to view without any problem. Different from that, its gauge can display up to 300MPH which will indicate instant Speed display. The speedometer also features re-settable trip meter, Odometer as well as a compass that is both numeric and visual. 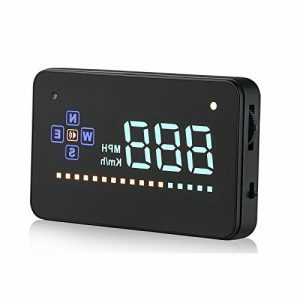 You can install this speedometer at any vehicle provided you have external power source 12-24VDC battery or alternator. This is a brilliant GPS speedometer that displays the speed of the car on the windshield. Different from other kinds of Car HUDs, this one is universal and can be used by any type of vehicle regardless of their model or brand. It features a 2.2 inches TFT LCD screen that displays data while monitoring speed giving more fun to your driving experience. The Car HUDs will display driving distance measurement, satellite time and number, voltage, driving direction, vehicle speed and can switch between miles to kilometers. It’s a multi functional tool that assists you to know about your car. 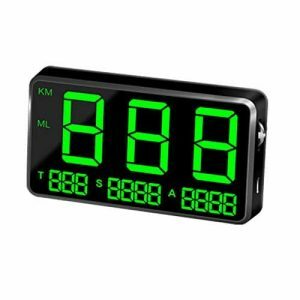 The LeaningTech GPS speedometer comes with a green light back-light display and a high-speed recall for cars, boats, and motorcycles as well. The green light will make the drive feel more comfortable and will protect the driver eyes particularly when driving for long distance. It also projects instance speed with GPS satellite and there is no wiring required. The total distance and the driving time will be displayed on the display and will assist you to know the important information about the trip. The device comes with an over-speed warning alarm for safe driving. Compatible with all cars and trucks. The main reason for having a GPS speedometer is to know the vehicle information such as speed, Trip Distance, time/date, voltage, driving direction and many more. The GPS speedometer listed above are compatible with most vehicles and they are easy to install. Choose the one that you feel it will meet your need for a safe and sound ride.